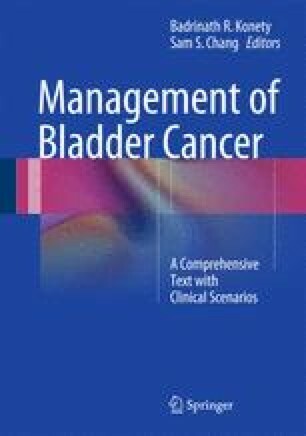 Under the rubric of non-muscle invasive bladder cancer (NMIBC) there is a variegated spectrum of disease. In this chapter, we will adhere narrowly to a single type of patient: a patient with NMIBC at high risk for recurrence and a significant potential for disease progression. Throughout this chapter we will discuss the nuances of treating a patient where, often, indications become equivocal and guidelines less than guiding. Barocas DA, Liu A, Burks FN, Suh RS, Shuster TG, Bradford T, Moylan, DA, Knapp, PM, Murtagh DS, Morris D, Dunn RL, Montie JE, Miller DC. Practice-base collaboration to imprvoe the use of immediate intravesical therapy after resection for non-muscle-invasive bladder cancer. J Urol. 2013. pii: S0022-5347(13)04620-X. doi: 10.1016/j.juro.2013.06.025. [Epub ahead of print].